Bill Drummond 's creative actions, works, texts and moments of influence are too numerous to list. But let's have a go - theatrical carpenter, set designer for the first staging of The Illuminatus Trilogy, guitarist for Big In Japan (with Budgie, Holly Johnson, Ian Broudie, etc), producer for Echo & the Bunnymen and The Teardrop Explodes, Justified Ancient of Mu Mu, Zoo Records founder, 50% of KLF, winner of the 1992 BRIT Award for "Best British group" (later that night KLF left a dead sheep outside an aftershow party with a note: "I died for you - bon appetit"), founder of the K Foundation, well known burner of £1,000,000 on the isle of Jura, author of such influential texts as "How to be an Artist", "The Manual (How to Have a Number One the Easy Way)" and "$20,000", distributor of soup (as art), distributor of cake (as art), shoe-shiner (on the streets of Venice during the biennale), founder of No Music Day, creator of The17, Select Magazine's Coolest Person in Pop 1992, and co-composer of "What Time Is Love? ", "3 a.m. Eternal", "Last Train to Trancentral" and "Justified and Ancient"... that's just for starters, click some of those links and go down the rabbit hole. 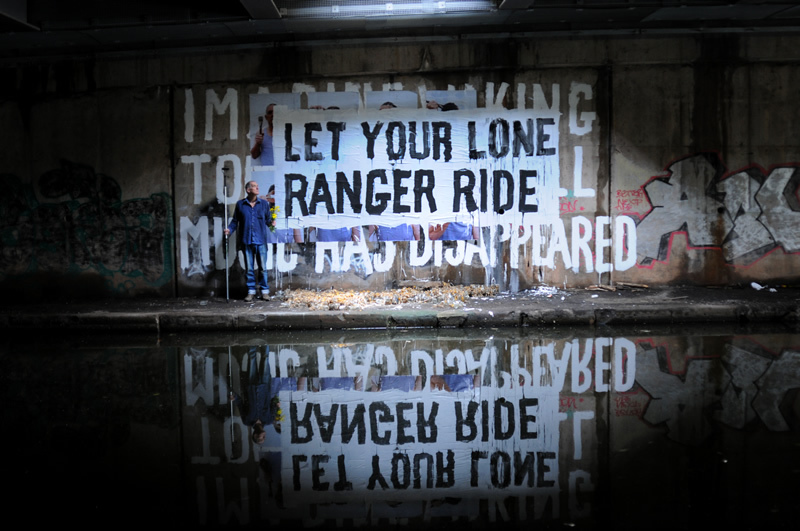 "LET YOUR LONE RANGER RIDE" is the title of one of Bill Drummond's Twelve Steps, which grew out of his Ten Commandments of Art published in the Guardian in 2014. Bill is currently in the course of completing a 12 year world tour - each year of the tour, he daubs the title of one of these Twelve Steps under Spaghetti Junction in Birmingham (see photo above, which is by Tracey Moberly). The forthcoming film BEST BEFORE DEATH, will document parts of the tour. Elsewhere in the world of film, Bill is currently engaged in a nine-year tour of The Atlantic Archipelago (aka The British Isles), screening his film "IMAGINE WAKING UP TOMORROW AND ALL MUSIC HAS DISAPPEARED" (see trailer above) once a year in places selected for their linguistic history. There's also a veritable mine of one-minute talks by Bill at www.60sixtyseconds.com - one film is activated each day. This workshop will contain discussion, debate, arguing; the making of things that no passer-by would recognise as art; the making of art that will require interaction with the unforewarned local population; regret; compromise; the creation and destruction of doctrines; pain; relief; maybe some joy, and breakfast. And soup, made by Bill. Working in the classroom, outdoors in the landscape, in the studio, through group and individual guidance, this session will embrace the principles of free thought, metacritical assessment of art and music, and avoidance (and simultaneous generation) of absurdity. POST-COURSE SUPPORT: EXHIBITION, RELEASE, PUBLICATION AND BROADCAST OPPORTUNITIES VIA FUSE ART SPACE, CAMP RADIO, OUR STABLE OF IN-HOUSE PUBLISHING IMPRINTS AND RECORD LABELS, AND OUR NETWORK OF PARTNER VENUES AND ORGANISATIONS.